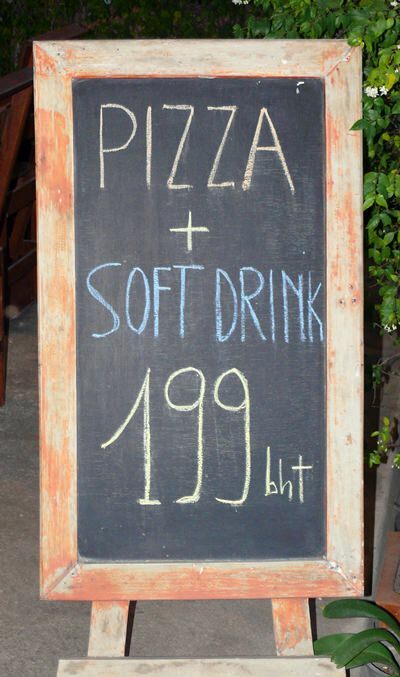 Have you heard of the Italian banker who came to Thailand and opened a restaurant? If you haven’t, you can find one at the Cotto restaurant at Nong Prue. Andrea Salvini was a banker for 24 years, but learned the restaurant trade working as a restaurant manager after banking hours. His dream was to be a restaurateur so he resigned and came to Thailand and opened Cotto three years ago. Andrea has a big smile on his face. Once you have mastered the Pornprapamit cross roads intersection with Chaiya­pornwitee, which has offset arms, proceed for about 50 meters and Cotto is on the 90 degree bend to the left. Just before the bend is an opening into the Cotto parking area. Careful with the narrow entrance. 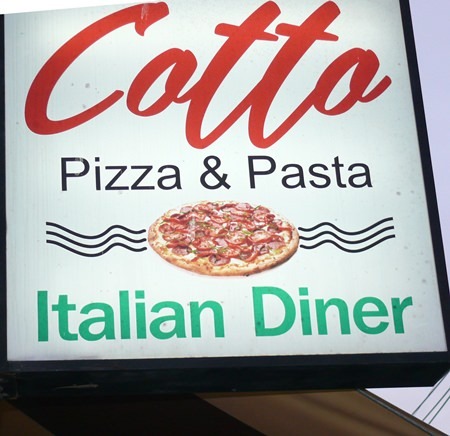 Cotto is a small “family” style restaurant with pizzas and pastas as the most popular dishes, but the menu has much more than the two Italian staples. Appetizers are B. 140-200, next up are the 17 types of pizza (B. 280-300), followed by pastas (B. 220-260) and then a list of sandwiches all at B. 180, including one called the Undertaker! Andrea has a sense of humor as well as a big smile. Mains include lamb (B. 340), tenderloin beef (B. 380) and tenderloin pork. Andrea also has rotating specials on the blackboard outside. The restaurant is small with rustic diners’ tables overlooking the road and the (even smaller) kitchen at the back, which incorporates a pasta cooker and the pizza oven, gas rings, deep freeze and refrigerator. Plus Andrea, his girlfriend and an assistant and a very bubbly pizzaioli (the employee who cooks pizzas). Andrea, who has been cooking pizzas himself for 10 years, also teaches the art, if you ask him. The Dining Out team ordered a Carbonara Pasta and a Margherita pizza. The portion sizes were very generous, and having seen the size of the pastas we shared it, as well as the pizza. 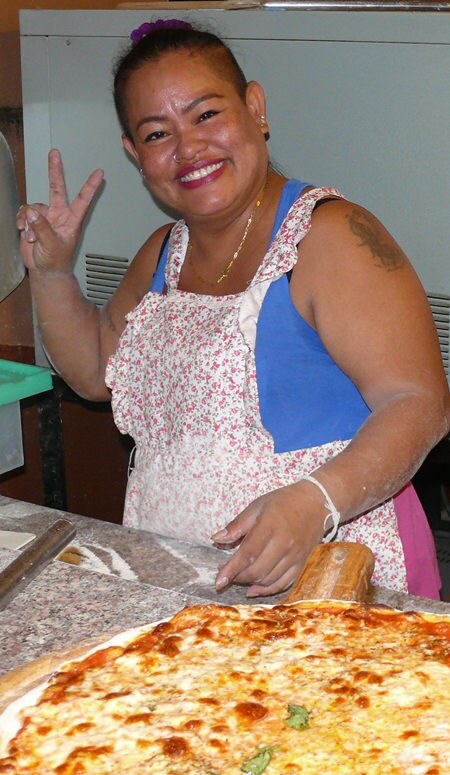 The happiest pizzaioli in town. I have to admit I don’t order Margherita very often as the offering tends to be lacking in taste, but since I was going to share with one of the Junior Tasters I acceded to the choice. Wow! 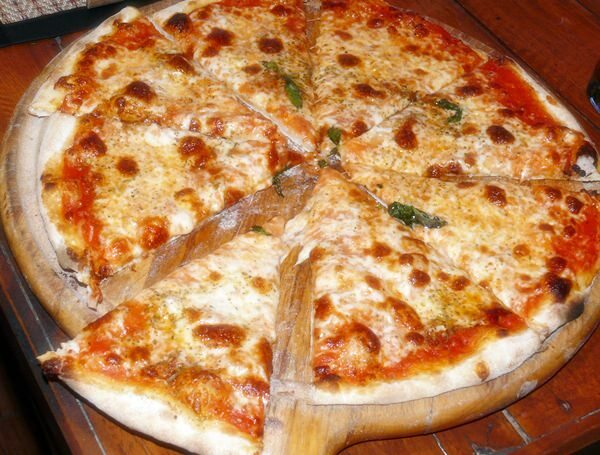 This was a Margherita with plenty of taste and very enjoyable. The size was also very large. Do try and you’ll see what I mean. Meanwhile our photographer, who ordered the Carbonara, came to a halt three quarters of the way through. “I’m full – or rather Im Lao. Fortunately the pizza taster assisted and there were only empty plates returned to the kitchen. I drank Andrea’s offered red wine, and despite it being Chilean and not Italian, was a simple vin de table but quaffable and enjoyable. Dining at Cotto was like a family dinner at home. No airs and graces but warmth and humor and Andrea and his staff making sure we enjoyed ourselves. Go once (to find the way) and you will go again. We have. Twice.